I was called to see a 56 year old normal weight lady tonight at 6 pm (after my third morbidly obese lap chole of week (370 pounds, 325 pounds and 262 pounds with diabetes mellitus on insulin x 15 years, plus hypertension, congestive heart failure – all women) – I did 2 normal weight lap choles also in past week. This 56 year old lady had had previous abdominal hysterectomy, open appy and open cholecystectomy. She had cappucino at 11:30 this am and a few potato chips, then developed severe lower abdominal pain centered to the left of the midline. She was writing in pain, which was constant with rhythmic (but not on a set schedule) exacerbations. White blood count was 10,800 with a left shift. Urinalysis was normal. Liver profile was normal. Sonogram of bile ducts was normal. Flat and upright abdominal films were normal. She had passed a little stool and a little gas and momentarily felt better but then the severe pain returned. She was nauseated. We placed an NG and got a little thick yellow fluid (no odor). At this point, I was impressed by her pain and tenderness (same point to left of lower midline incision), so in spite of no diagnosis, offered her laparotomy. As she was going to sleep, I confirmed that the same area was still tender and firm. After she went to sleep, I felt the area one more time (unsure of diagnosis) and something squished and the lump went away. I lapped her anyway and found chylous ascites, plus a clear demarcation between larger and smaller small bowel with reddened anti-mesenteric border – no residual small bowel obstruction, but I strongly suspect I reduced this was my immediate pre-procedure palpation. There was no hernia at this point. She had about 1 cm of chyle along the small bowel mesenteric border just proximal to the area of demarcation (far more than the usual chyle you see in the lymphatics after a fatty meal). 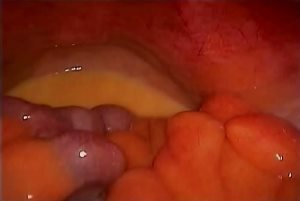 There was no chronic appearing dilation of the small bowel – I think this was an acute process. Interesting case, I hope your pt does well and recover. 1. What self-medications did he use? 2. Any positive blood cultures? 3. What are the status of his lungs and kidneys.? I think it is enteric fever or E.coli toxin leading to septecemia. Any results of marrow culture. AFB smears. I’m trying to help in such a difficult case.It seems to be some kind of Tiphoid Fever with a huge septicemia and clinical manifestations of typhic meningoencephalitis.It would be convenient to add to therapy hydrocortisone in good doses protecting the pt. with omeprazole i.v. or Famotidine i.v.